In 1862 the armed forces of the United States undertook the first massive campaigns to defeat the southern Confederacy. Better organization, training, and leadership would be displayed on both sides as the combat became more intense. Young American citizen soldiers would find that war was not a romantic adventure and their leaders would learn that every victory had its price. As the winter of 1861-62 wore on, McClellan exaggerated his difficulties and the enemy's strength, and discounted the Confederacy's problems. He drilled and trained the Army of the Potomac while western forces under his general command accomplished little. Lincoln and the Union waited impatiently for a conclusive engagement. But neither the Union nor the Confederate Army showed much inclination to move, each being intent on perfecting itself before striking a heavy blow. The President was particularly eager to support Unionist sentiment in east Tennessee by moving forces in that direction. Above all he wanted a concerted movement to crush the rebellion quickly. In an effort to push matters Lincoln issued General War Order No. 1 on January 27, 1862. This order, besides superfluously telling the armies to obey existing orders, directed that a general movement of land and sea forces against the Confederacy be launched on February 22, 1862. Lincoln's issuance of an order for an offensive several weeks in advance, without considering what the weather and the roads might be like, has been scoffed at frequently. But apparently he issued it only to get McClellan to agree to move. Even before Lincoln sent the directive his intentions were overtaken by events in the western theater. Students of the Civil War often concentrate their study upon the cockpit of the war in the east�Virginia. The rival capitals lay only a hundred miles apart and the country between them was fought over for Pour years. But it was the Union armies west of the Appalachians that struck the death knell of the Confederacy. These Union forces in late 1861 were organized into two separate commands. Brig. Gen. Don Carlos Buell commanded some 45,000 men from a headquarters at Louisville, Kentucky, while Maj. Gen. Henry W. Halleck with headquarters at St. Louis, Missouri, had 91,000 under his command. These troops were generally raw, undisciplined western volunteers. Logistical matters and training facilities were undeveloped and as Halleck once wrote in disgust to his superior in Washington, "affairs here are in complete chaos." Affairs were no better among Confederate authorities farther south. Facing Buell and Halleck were 43,000 scattered and ill-equipped Confederate troops under General Albert Sidney Johnston. Charged with defending a line which stretched for more than 500 miles from western Virginia to the border of Kansas, Johnston's forces mostly lay east of the Mississippi River. They occupied a system of forts and camps from Cumberland Gap in western Virginia through Bowling Green, Kentucky, to Columbus, Kentucky, on the Mississippi. Rivers and railroads provided Johnston with most of his interior lines of communications since most of the roads were virtually impassable in winter. To protect a lateral railroad where it crossed two rivers in Tennessee and yet respect Kentucky's neutrality, the Confederates had built Fort Henry on the Tennessee River and Fort Donelson on the Cumberland River just south of the boundary between the two states. On the other hand, hampering the Confederate build-up were southern governors whose states' rights doctrine led them to believe that defense of their respective states had higher priority than pushing forward the needed men and munitions to a Confederate commander, Johnston, at the front. Confederate defense line in eastern Kentucky in a local action near Mill Springs, but Buell failed to exploit the victory. In Halleck's department, Brig. Gen. Ulysses S. Grant, at the time an inconspicuous district commander at Cairo, Illinois, had meanwhile proposed a river expedition up the Tennessee to take Fort Henry. After some hesitancy and in spite of the absence of assurance of support from Buell, Halleck approved a plan for a joint Army-Navy expedition. On January 30, 1862, he directed 15,000 men under Grant, supported by armored gunboats and river craft of the U.S. Navy under Flag Officer Andrew H. Foote, to "take and hold Fort Henry." The actions of subordinate commanders were at last prodding the Union war machine to move. Grant landed his troops below Fort Henry and together with Foote's naval force moved against the Confederate position on February 6. At the Federals' approach the Confederate commander sent most of his men to Fort Donelson. Muddy roads delayed the Union Army's advance, but Foote's seven gunboats plunged ahead and in a short fire fight induced the defenders of Fort Henry to surrender. Indeed, the Confederates had lowered their colors before Grant's infantry could reach the action. The Tennessee River now lay open to Foote's gunboats all the way to northern Alabama. General Grant was no rhetorician. Sparing with words, he never bombarded his troops with Napoleonic manifestos as McClellan did. After the capture of Fort Henry he simply telegraphed the somewhat surprised Halleck: "I shall take and destroy Fort Donelson on the 8th and return to Fort Henry." But inclement weather delayed the Federal movement until February 12. Then river craft carried some of the troops by water around to Fort Donelson. The rest of the troops moved overland under sunny skies and unseasonably mild temperatures. The spring-like weather caused the youthful soldiers to litter the roadside with overcoats, blankets, and tents. Henry. But this time the Confederate defenders handled the gunboats so roughly that they withdrew. Grant then prepared for a long siege, although the bitter cold weather and lack of assault training among his troops caused him to have some reservations. The Confederates, sensing they were caught in a trap, essayed a sortie on February 15, and swept one of Grant's divisions off the field. But divided Confederate command, not lack of determination or valor on the part of the fighting men, led to ultimate defeat of the attack. The three Confederate commanders could not agree upon the next move, and at a critical moment, Grant ordered counterattacks all along the line. 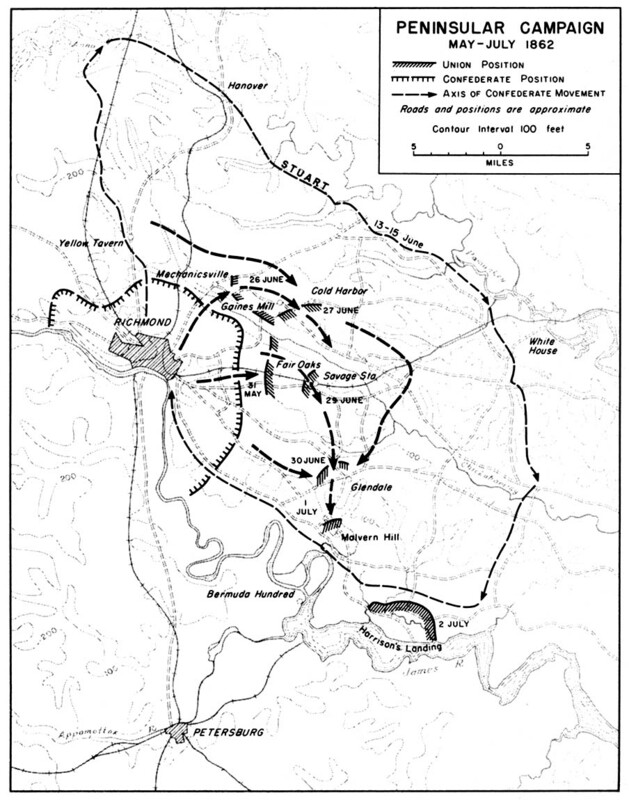 By the end of the day Union troops had captured a portion of the Confederate outer works. Now surrounded by Union forces that outnumbered them almost two to one, the Confederate leaders decided they were in a hopeless situation. In a scene resembling opéra bouffe, Brig. Gen. John B. Floyd, who had been Buchanan's Secretary of War and feared execution as a traitor, passed the command to Brig. Gen. Gideon Pillow. Pillow passed the command immediately to Brig. Gen. Simon B. Buckner, who asked Grant, an old friend, for terms. Soon afterward Grant sent his famous message: "No terms except unconditional and immediate surrender can be accepted. I propose to move immediately upon your works." Some Confederates escaped with Floyd and Pillow, and Col. Nathan Bedford Forrest led his cavalry through frozen backwaters to safety. But the bulk of the garrison "from 12,000 to 15,000 prisoners . . . also 20,000 stand of arms, 48 pieces of artillery, 17 heavy guns, from 2,000 to 4,000 horses, and large quantities of commissary stores" fell into Federal hands. Poor leadership, violation of the principle of unity of command, and too strict adherence to position defense had cost the South the key to the gateway of the Confederacy in the west. The loss of the two forts dealt the Confederacy a blow from which it never fully recovered. Johnston had to abandon Kentucky and most of middle and west Tennessee. The vital industrial and transportation center of Nashville soon fell to Buell's advancing army. Foreign governments took special notice of the defeats. For the North the victories were its first good news of the war. They set the strategic pattern for further advance into the Confederacy. In Grant the people had a new hero and he was quickly dubbed "Unconditional Surrender" Grant. armies, and on March 11 Halleck received the command. Halleck, nicknamed "Old Brains," was well known as a master of the theory and literature of war. Lincoln's decision gave him jurisdiction over four armies�Buell's Army of the Ohio, Grant's Army of the Tennessee, Maj. Gen. Samuel Curtis' Army of the Southwest in Missouri and Arkansas, and Maj. Gen. John Pope's Army of the Mississippi. While Pope, in co-operation with Foote's naval forces, successfully attacked New Madrid and Island No. 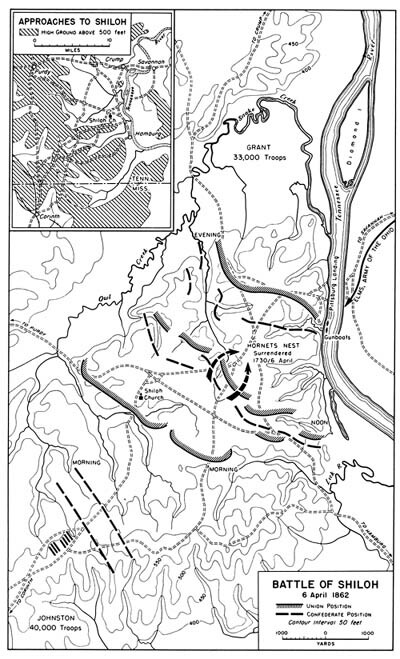 10 on the Mississippi River, Halleck decided to concentrate Grant's and Buell's armies and move against Johnston at Corinth in northern Mississippi. Grant and Buell were to meet at Shiloh (Pittsburgh Landing) near Savannah on the Tennessee River. Well aware of the Federal movements, Johnston decided to attack Grant before Buell could join him. (Map 24) The Confederate army, 40,000 strong, marched out of Corinth on the afternoon of April 3. Muddy roads and faulty staff co-ordination made a shambles of Confederate march discipline. Mixed up commands, artillery and wagons bogged down in the mud, and green troops who insisted upon shooting their rifles at every passing rabbit threatened to abort the whole expedition. Not until late in the afternoon of April 5 did Johnston's army complete the 22-mile march to its attack point. Then the Confederate leader postponed his attack until the next morning and the delay proved costly. Grant's forces were encamped in a rather loose battle line and apparently anticipated no attack. The position at Shiloh itself was not good, for the army was pocketed by the river at its back and a creek on each flank. Because the army was on an offensive mission, it had not entrenched. Grant has often been criticized for this omission, but entrenchment was not common at that stage of the war. The fact that the principle of security was disregarded is inescapable. Very little patrolling had been carried out, and the Federals were unaware that a Confederate army of 40,000 men was spending the night of April 5 just two miles away. The victories at Forts Henry and Donelson had apparently produced overconfidence in Grant's army, which like Johnston's, was only partly trained. Even Grant reflected this feeling, for he had established his headquarters at Savannah, nine miles downstream. disorganized the attackers. Johnston's attack formation had been awkward from the beginning. He had formed his three corps into one column with each corps deployed with divisions in line so that each corps stretched across the whole battlefront, one behind the other. Such a formation could be effectively controlled neither by army nor corps commanders. Then, almost at the moment of victory, Johnston himself was mortally wounded while leading a local assault. General Beauregard, Johnston's successor, suspended the attack for the day and attempted to straighten out and reorganize his command. As the day ended, Grant's sixth division, which had lost its way while marching to the battlefield, reached Shiloh along with advance elements of Buell's army. Next morning Grant counterattacked to regain the lost ground and the Confederates withdrew to Corinth. There was no pursuit. Shiloh was the bloodiest battle fought in North America up to that time. Of 63,000 Federals, 13,000 were casualties. The Confederates lost 11,000. Fortunate indeed for the Federals had been Lincoln's decision to unify the command under Halleck, for this act had guaranteed Buell's presence and prevented Johnston from defeating the Union armies separately. Grant came in for much denunciation for being surprised, but President Lincoln loyally sustained him. "I can't spare this man; he fights." Halleck was a master of military maxims, but he had failed to concentrate all his forces immediately for a final defeat of Beauregard. As it was, Pope and Foote took Island No. 10 in April, opening the Mississippi as far as Memphis. Halleck, taking personal command of Grant's and Buell's forces, then ponderously advanced toward Corinth. Remembering Shiloh, he proceeded cautiously, and it was May 30 before he reached his objective. Beauregard had already evacuated the town. Meanwhile Capt. David G. Farragut with a naval force and Maj. Gen. Benjamin F. Butler's land units cracked the gulf coast fortifications of the Mississippi and captured New Orleans. By mid-1862, only strongholds at Vicksburg and Port Hudson on the Mississippi blocked complete Federal control of that vital river. Confederate "wizards of the saddle" like John Hunt Morgan, Joseph Wheeler, and Nathan Bedford Forrest followed Forrest's adage of "Get 'em sheered, and then keep the sheer on 'em." Such tactics completely disrupted the timetable of Federal offensives. By summer and fall rejuvenated Confederate forces under General Braxton Bragg, Lt. Gen. Edmund Kirby Smith, and Maj. Gen. Earl Van Dorn were ready to seize the initiative. Never again was the South so close to victory, nor did it ever again hold the initiative in every theater of the war. Over-all Confederate strategy called for a three-pronged advance from the Mississippi River all the way to Virginia. 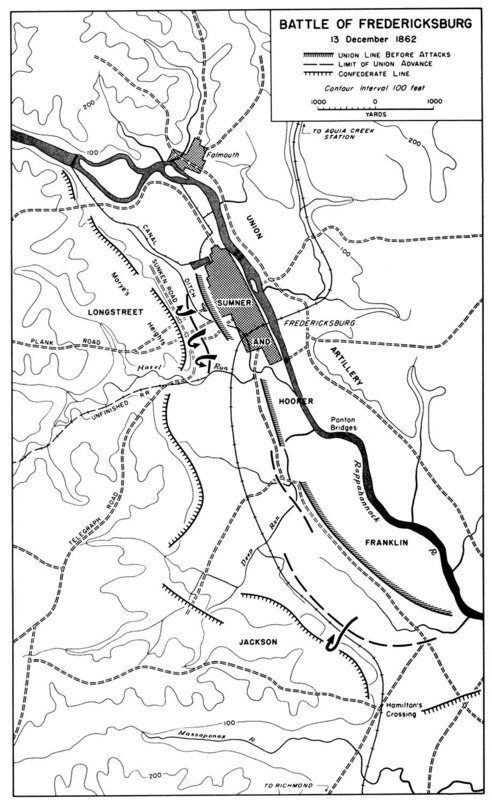 Twin columns under Bragg and Smith were to bear the brunt of the western offensive by advancing from Chattanooga into east Tennessee, then northward into Kentucky. They were to be supported by Van Dorn, who would move north from Mississippi with the intention of driving Grant's forces out of west Tennessee. The western columns of the Confederacy were then to unite somewhere in Kentucky. At the same time, these movements were to be coordinated with the planned invasion of Maryland, east of the Appalachians, by General Robert E. Lee's Army of Northern Virginia. Much depended upon speed, good coordination of effort and communications, and attempts to woo Kentucky and Maryland into the arms of the Confederacy. Victory could stimulate peace advocates and the Copperheads in the North to bring peace. Furthermore there was always the possibility that a successful invasion might induce Great Britain and France to recognize the Confederacy and to intervene forcibly to break the blockade This last hope was a feeble one. Emperor Napoleon III was primarily interested in advancing his Mexican schemes; he considered both recognition and intervention but would not move without British support. Britain, which pursued the policy of recognizing de facto governments, would undoubtedly have recognized the Confederacy eventually had it won the war. But the British Government only briefly flirted with the idea of recognition and throughout the war adhered to a policy of neutrality and respect for the Union blockade. At first things went well for the Confederates in the west. Bragg caught Buell off guard and without fighting a battle forced Federal evacuation of northern Alabama and central Tennessee. But when Bragg entered Kentucky he became engaged in "government making" in an effort to set up a state regime which would bind Kentucky to the Confederacy. Also, the Confederate invasion was not achieving the expected results since few Kentuckians joined Bragg's forces and an attempt at conscription in east Tennessee failed completely. trating his own scattered units. The next morning fighting began around Perryville over possession of drinking water. Brig. Gen. Philip H. Sheridan's division forced the Confederates away from one creek and dug in. The battle as a whole turned out to be a rather confused affair as Buell sought to concentrate units arriving from several different directions upon the battlefield itself. Early in the afternoon, Maj. Gen. Alexander M. McCook's Union corps arrived and began forming a line of battle. At that moment Maj. Gen. Leonidas Polk's Confederate corps attacked and drove McCook back about a mile, but Sheridan's troops held their ground. Finally a Union counterattack pushed the Confederates out of the town of Perryville. Buell himself remained at headquarters, only two and a half miles from the field, completely unaware of the extent of the engagement until it was nearly over. The rolling terrain had caused an "acoustic shadow" whereby the sounds of the conflict were completely inaudible to the Federal commander. While the battle ended in a tactical stalemate, Bragg suffered such severe casualties that he was forced to retreat. Coupled with Van Dorn's failure to bypass Federal defenses at Corinth, Mississippi, and carry out his part of the strategic plan, this setback forced the Confederates to abandon any idea of bringing Kentucky into the Confederacy. By Christmas Bragg was back in middle Tennessee, battered but still anxious to recoup his losses by recapturing Nashville. Buell had been dilatory in pursuing Bragg after Perryville and had been replaced in command of the Army of the Ohio (now restyled the Army of the Cumberland) by Maj. Gen. William S. Rosecrans. In spite of urgent and even threatening letters from the War Department, the new commander would not move against Bragg until he had collected abundant supplies at Nashville. Then he would be independent of the railroad line from Nashville to Louisville, a line of communications continually cut by Confederate cavalry. On December 26 Rosecrans finally marched south from Nashville. Poorly screened by Union cavalry, his three columns in turn knew little about Confederate concentrations near Murfreesboro, thirty miles southeast of the Tennessee capital. Here Bragg had taken a strong position astride Stones River on the direct route to Chattanooga and proposed to fight it out. Rosecrans moved into line opposite Bragg on the evening of December 30. Both army commanders proceeded to develop identical battle plans�each designed to envelop the opponent's right flank. Bragg's objective was to drive Rosecrans off his communications line with Nashville and pin him against the river. Rosecrans' plan had the same objective in reverse, that of pinning the Confederates against the stream. Victory would probably belong to the commander who struck first and hard. havoc among Rosecrans' rear area elements. As was typical of many Civil War battles the attacking columns of Polk and Hardee became badly intermingled. Their men began to tire, and by afternoon repeated Confederate assaults against the constricted Union line along the Nashville pike had bogged down. That night Rosecrans held a council of war. Some of the subordinate commanders wanted to retreat. Rosecrans and two of his corps commanders, Maj. Gen. Thomas L. Crittenden and Maj. Gen. George H. Thomas, vetoed the scheme. Brigades were then returned to their proper divisions, stragglers rounded up, and various other adjustments made in the Federal position. New Year's Day, 1863, dawned quiet and little action occurred that day. The sunrise of January 2 revealed Rosecrans still in position. Bragg directed Breckinridge to attack the Union left wing, once more thrown across Stones River on the north. But massed Union artillery shattered the assaults and counterattacking Federals drove Breckinridge's men back to their line of departure. The armies remained stationary on January 3 but Bragg finally withdrew from the battlefield that evening, permitting victory to slip from his grasp. 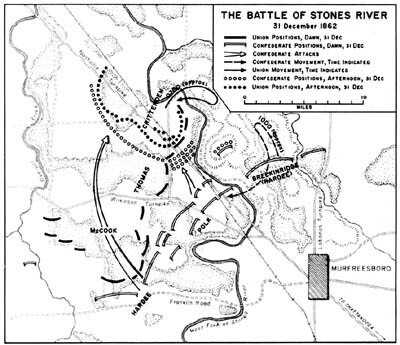 Tactically a draw, Stones River so badly mangled the Army of the Cumberland that it would be immobilized for six months. 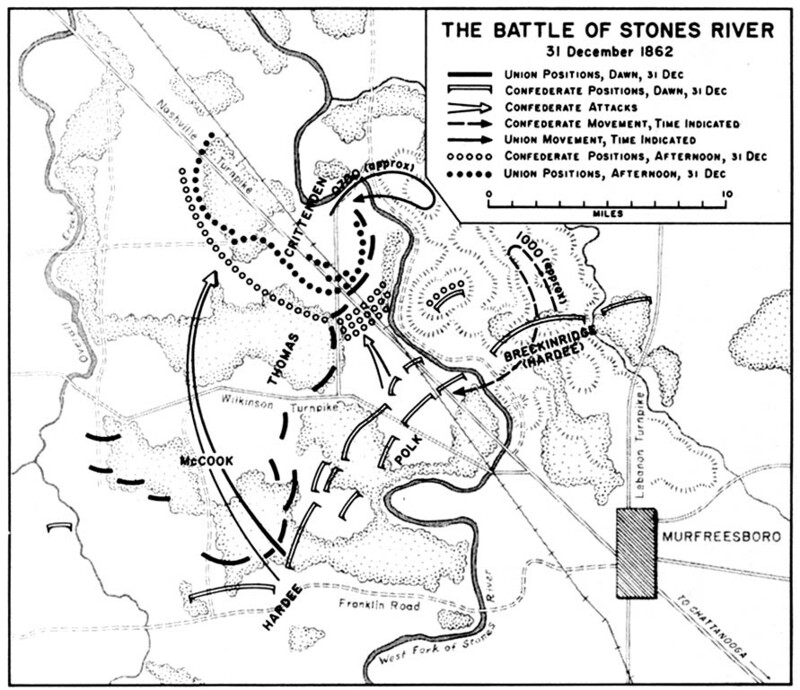 Yet, more than most other battles of the war, Stones River was a conflict between the wills of the opposing army leaders. Rosecrans, supported by Thomas and others, would not admit himself beaten and in the end won a victory of sorts. 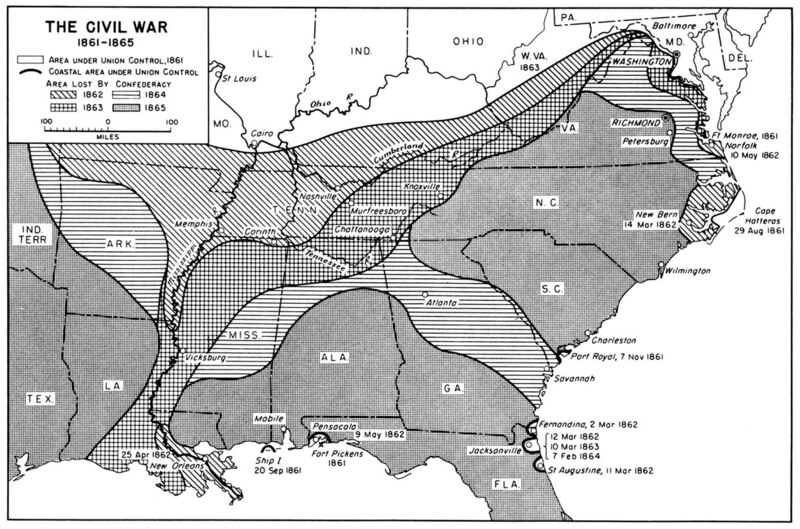 The great Confederate counteroffensives of 1862 had failed in the west, yet Chattanooga, the key to east Tennessee and Georgia, remained in southern hands. 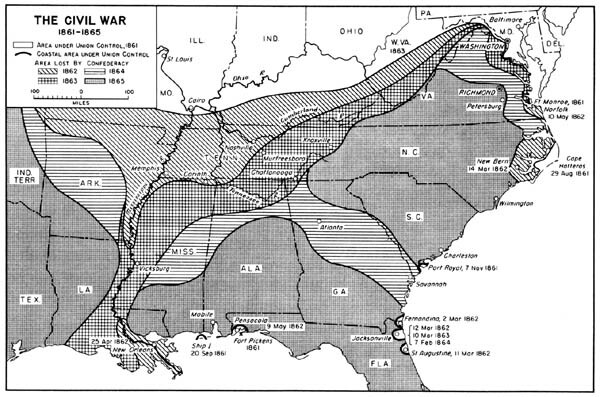 Farther west Federal forces had penetrated only slightly into northern Mississippi. The war was simply on dead center in the west at the end of the year. away. Johnston, however, rendered this plan obsolete; he withdrew from Manassas to Fredericksburg, halfway between the two capitals and astride McClellan's prospective route of advance. Early in March McClellan moved his army out to the deserted Confederate camps around Manassas to give his troops some field experience. While he was in the field President Lincoln relieved him as General in Chief, doubtless on the ground that he could not command one army in the field and at the same time supervise the operations of all the armies of the United States. Lincoln did not appoint a successor. For a time he and Stanton took over personal direction of the Army, with the advice of a newly constituted Army board consisting of the elderly Maj. Gen. Ethan A. Hitchcock and the chiefs of the War Department bureaus. When events overtook the Urbana scheme, McClellan began to advocate a seaborne move to Fort Monroe, Virginia (at the tip of the peninsula formed by the York and James Rivers), to be followed by an overland advance up the peninsula. If the troops moved fast, he maintained, they could cover the seventy-five miles to Richmond before Johnston could concentrate his forces to stop them. This plan had promise, for it utilized Federal control of the seas and a useful base of operations at Fort Monroe and there were fewer rivers to cross than by the overland route. Successful neutralization of the Merrimac by the Monitor on March 9 had eliminated any naval threat to supply and communications lines, but the absence of good roads and the difficult terrain of the peninsula offered drawbacks to the plan. Lincoln approved it, providing McClellan would leave behind the number of men that his corps commanders considered adequate to insure the safety of Washington. McClellan gave the President his assurances, but failed to take Lincoln into his confidence by pointing out that he considered the Federal troops in the Shenandoah Valley to be covering Washington. In listing the forces he had left behind, he counted some men twice and included several units in Pennsylvania not under his command. Embarkation began in mid-March, and by April 4 advance elements had moved out of Fort Monroe against Yorktown. The day before, however, the commander of the Washington defenses reported that he had insufficient forces to protect the city. In addition, Stonewall Jackson had become active in the Shenandoah Valley. Lincoln thereupon told Stanton to detain one of the two corps which were awaiting embarkation at Alexandria. Stanton held back McDowell's corps, numbering 30,000 men, seriously affecting McClellan's plans. Always mystify, mislead, and surprise the enemy, if possible; and when you strike and overcome him, never give up the pursuit as long as your men have strength to follow; for an army routed, if hotly pursued, becomes panic-stricken and can then be destroyed by half their number. 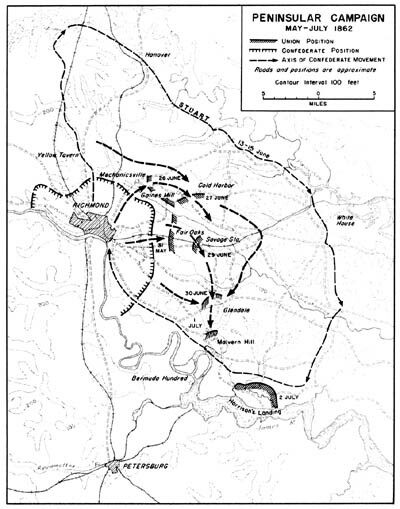 By mobility and maneuver, achieved by rapid marches, surprise, deception, and hard fighting, Jackson neutralized and defeated in detail Federal forces three times larger than his own. In a classic campaign between March 23 and June 9, 1862, he fought six battles: Kernstown, McDowell, Front Royal, Winchester, Cross Keys, and Port Republic. All but Kernstown were victories. His presence alone in the Shenandoah immobilized McDowell's corps by keeping these reinforcements from joining McClellan before Richmond. When McClellan reached the peninsula in early April he found a force of ten to fifteen thousand Confederates under Maj. Gen. John B. Magruder barring his path to Richmond. Magruder, a student of drama and master of deception, so dazzled him that McClellan, instead of brushing the Confederates aside, spent a month in a siege of Yorktown. But Johnston, who wanted to fight the decisive action closer to Richmond, decided to withdraw slowly up the peninsula. At Williamsburg, on May 5, McClellan's advance elements made contact with the Confederate rear guard under Maj. Gen. James Longstreet, who successfully delayed the Federal advance. McClellan then pursued in leisurely fashion. By May 25, two corps of the Army of the Potomac had turned southwest toward Richmond and crossed the sluggish Chickahominy River. Drenching rains on May 30 raised the Chickahominy to flood stage and seriously divided McClellan's army. Johnston decided to grasp this chance to defeat the Federals in detail. He struck on May 31 near Fair Oaks. His plans called for his whole force to concentrate against the isolated corps south of the river, but his staff and subordinate commanders were not up to the task of executing them. Assaulting columns became confused, and attacks were delivered piecemeal. The Federals, after some initial reverses, held their ground and bloodily repulsed the Confederates. When Johnston suffered a severe wound at Fair Oaks, President Davis replaced him with General Lee. Lee for his part had no intention of defending Richmond passively. The city's fortifications would enable him to protect Richmond with a relatively small force while he used the main body of his army offensively in an attempt to cut off and destroy the Army of the Potomac. He ordered Jackson back from the Shenandoah Valley with all possible speed. McClellan had planned to utilize his superior artillery to break through the Richmond defenses, but Lee struck the Federal Army before it could resume the advance. Lee's dispositions for the Battle of Mechanicsville on June 26 present a good illustration of the principles of mass and economy of force. On the north side of the Chickahominy, he concentrated 65,000 men to oppose Brig. Gen. Fitz-John Porter's V Corps of 30,000. Only 25,000 were left before Richmond to contain the remainder of the Union Army. When Lee attacked, the timing and co-ordination were off; Jackson of all people was slow and the V Corps defended stoutly during the day. McClellan thereupon withdrew the V Corps southeast to a stronger position at Gaines' Mill. Porter's men constructed light barricades and made ready. Lee massed 57,000 men and assaulted 34,000 Federals on June 27. The fighting was severe but numbers told, and the Federal line broke. Darkness fell before Lee could exploit his advantage, and McClellan took the opportunity to regroup Porter's men with the main army south of the Chickahominy. 90,000 men, the artillery train, 3,100 wagons, and 2,500 head of cattle, began on the night of June 27 and was accomplished by using two roads. Lee tried to hinder the movement but was held off by Federal rear guards at Savage Station on June 29 and at Frayser's Farm (Glendale) on the last day of the month. By the first day of July McClellan had concentrated the Army of the Potomac on a commanding plateau at Malvern Hill, northwest of Harrison's Landing. The location was strong, with clear fields of fire to the front and the flanks secured by streams. Massed artillery could sweep all approaches, and gunboats on the river were ready to provide fire support. The Confederates would have to attack by passing through broken and wooded terrain, traversing swampy ground, and ascending the hill. At first Lee felt McClellan's position was too strong to assault. Then, at 3:00 p.m. on July 1, when a shifting of Federal troops deceived him into thinking there was a general withdrawal, he changed his mind and attacked. Again staff work and control were poor. The assaults, which were all frontal, were delivered piecemeal by only part of the army against Union artillery, massed hub to hub, and supporting infantry. The Confederate formations were shattered because Lee failed to carry out the principle of mass. On the following day, the Army of the Potomac fell back to Harrison's Landing and dug in. After reconnoitering McClellan's position, Lee ordered his exhausted men back to the Richmond lines for rest and reorganization. The Peninsular Campaign cost the Federal Army some 15,849 men killed, wounded, and missing. The Confederates, who had done most of the attacking, lost 20,614. Improvement in the training and discipline of the two armies since the disorganized fight at Bull Run was notable. Also significant was the fact that higher commanders had not yet thoroughly mastered their jobs. Except in McClellan's defensive action at Malvern Hill, which was largely conducted by his corps commanders, neither side had been able to bring an entire army into coordinated action. armies in close concert to take advantage of the North's superior strength. If all Federal armies coordinated their efforts, Lincoln reasoned, they could strike where the Confederacy was weak or force it to strengthen one army at the expense of another, and eventually they could wear the Confederacy down, destroy the various armies, and win the war. Halleck turned out to be a disappointment. He never attempted to exercise field command or assume responsibility for strategic direction of the armies. But, acting more as military adviser to the President, he performed a valuable function by serving as a channel of communication between the Chief Executive and the field commanders. He adeptly translated the President's ideas into terms the generals could comprehend, and expressed the soldier's views in language that Mr. Lincoln could understand. Shortly before Halleck's appointment, Lincoln also decided to consolidate the various Union forces in the Shenandoah Valley and other parts of western Virginia�some 45,000 men�under the victor at Island No.10, Maj. Gen. John Pope. Pope immediately disenchanted his new command by pointing out that in the west the Federal armies were used to seeing the backs of their enemies. Pope's so-called Army of Virginia was ordered to divert pressure from McClellan on the peninsula. But Jackson had left the valley and Federal forces were scattered. On August 3, Halleck ordered McClellan to withdraw by water from the peninsula to Aquia Creek on the Potomac and to effect a speedy junction at Fredericksburg with Pope. Meanwhile Pope began posting the Army of Virginia along the Orange and Alexandria Railroad to the west of Fredericksburg. Lee knew that his Army of Northern Virginia was in a dangerous position between Pope and McClellan, especially if the two were to unite. On July 13, he sent Jackson, with forces eventually totaling 24,000 men, to watch Pope. After an initial sparring action at Cedar Mountain on August 9, Jackson and Pope stood watching each other for nearly a week. Lee, knowing that McClellan was leaving Harrison's Landing, had departed Richmond with the remainder of the Army of Northern Virginia and joined Jackson at Gordonsville. The combined Confederate forces outnumbered Pope's, and Lee resolved to outflank and cut off the Army of Virginia before the whole of McClellan's force could be brought to bear. through Thoroughfare Gap in the Bull Run Mountains around the northern flank of Pope's army and subsequently followed the same route with the divisions commanded by General Longstreet. Pope took note of Jackson's move, but first assumed that it was pointed toward the Shenandoah Valley. Then Jackson, covering nearly sixty miles in two days, came in behind Pope at Manassas on August 26, destroyed his supply base there, and slipped away unmolested. Pope marched and countermarched his forces for two days trying to find the elusive Confederates. At the same time the Union commander failed to take Lee's other forces into account. As a result he walked into Lee's trap on the site of the old battlefield of Manassas, or Bull Run. Pope attacked Jackson, posted behind an abandoned railroad embankment, but again the attack consisted of a series of piecemeal frontal assaults which were repulsed with heavy casualties. By then Porter's V Corps from the Army of the Potomac had reached the field and was ordered to attack Jackson's right (south) flank. By this time also, Longstreet's column had burst through Thoroughfare Gap, and deploying on Jackson's right, it blocked Porter's move. Next day, August 30, Pope renewed his attacks against Jackson, whom he thought to be retreating. Seizing the opportunity to catch the Federal columns in an exposed position, Lee sent Longstreet slashing along the Warrenton turnpike to catch Pope's flank in the air. The Federal army soon retired from the field and Pope led it back to Washington, fighting an enveloping Confederate force at Chantilly on the way. Lee, by great daring and rapid movement, and by virtue of having the Confederate forces unified under his command, had successfully defeated one formidable Union army in the presence of another even larger one. Halleck, as General in Chief, had not taken the field to co-ordinate Pope and McClellan, and Pope lost the campaign despite the advantage of interior lines. President Lincoln, desiring to use McClellan's admitted talents for training and reorganizing the battered eastern armies, had become convinced that bitter personal feelings between McClellan and Pope prevented them from working effectively in the same theater. On September 5, Halleck, upon the President's order, dissolved the Army of Virginia and assigned its units to the Army of the Potomac. He sent Pope to a command in Minnesota. The Union authorities expected that McClellan would be able to devote several months to training and reorganization, but Lee dashed these hopes. Up to this point the Confederates in the east had been following defensive strategy, though tactically they frequently assumed the offensive. But Davis and Lee, for a complicated set of political and military reasons, determined to take the offensive and invade the North in co-ordination with Bragg's drive into Kentucky. Militarily, in the east, an invasion of Maryland would give Lee a chance to defeat or destroy the Army of the Potomac, uncovering such cities as Washington, Baltimore, and Philadelphia, and to cut Federal communications with the states to the west. McClellan's rejuvenated Army of the Potomac, 90,000 men organized into 6 corps, marched northwest from Washington and reached Frederick on September 12. At this time McClellan had a stroke of luck. Lee, in assigning missions to his command, had detached Maj. Gen. D. H. Hill's division from Jackson and attached it to Longstreet and had sent copies of his orders, which prescribed routes, objectives, and times of arrival, to Jackson, Longstreet, and Hill. But Jackson was not sure that Hill had received the order. He therefore made an additional copy of Lee's order and sent it to Hill. One of Hill's orders, wrapped around some cigars, was somehow left behind in an abandoned camp where it was picked up on September Is by Union soldiers and rushed to McClellan. This windfall gave the Federal commander an unmatched opportunity to defeat Lee's scattered forces in detail if he pushed fast through the gaps. McClellan vacillated for sixteen hours. Lee, informed of the lost order, sent all available forces to hold the gaps, so that it was nightfall on the 14th before McClellan fought his way across South Mountain. Lee retreated to Sharpsburg on Antietam Creek where he turned to fight. Pinned between Antietam Creek and the Potomac with no room for maneuver, and still outnumbered since Jackson's force had yet to return to the main body after capturing Harpers Ferry, Lee relied on the advantage of interior lines and the boldness and the fighting ability of his men. McClellan delayed his attack until September 17, when he launched an uncoordinated series of assaults which drove back the Confederates in places but failed to break their line. Heavy fighting swelled across ripe fields and up through rocky glens that became known to history as the West Wood, the Cornfield, the East Wood, Bloody Lane, and Burnside's Bridge. One southerner remembered the attacking Union columns: "With flags flying and the long unfaltering lines rising and falling as they crossed the rolling fields, it looked as though nothing could stop them." But when the massed fire of field guns and small arms struck such human waves, a Union survivor recalled, it "was like a scythe running through our line." as many. Although Lee audaciously awaited new attacks on September 18, McClellan left him unmolested, and that night the Army of Northern Virginia withdrew across the Potomac. Antietam was tactically a draw, but the fact that Lee was forced to call off the invasion made it a strategic victory and gave President Lincoln an opportunity to strike at the Confederacy psychologically and economically by issuing the Emancipation Proclamation on September 22, 1862. Lincoln, while opposed to slavery and its extension to the western territories, was not an abolitionist. He had stated publicly that the war was being fought over union or secession, with the slavery question only incidental, and had earlier overruled several generals who were premature emancipators. But anticipating the total psychological warfare techniques of the twentieth century, he had for some time desired to free the slaves of the Confederate states in order to weaken their economies and to appeal to antislavery opinion in Europe. He had awaited the opportune moment that a Union victory would give him and decided that Antietam was suitable. Acting on his authority as Commander in Chief he issued the Proclamation which stated that all slaves in states or districts in rebellion against the United States on January 1, 1863, would be thenceforward and forever free. The Proclamation set no slaves free on the day it took effect. Negroes in the four slave states still in the Union were not touched, nor were the slaves in those Confederate areas that had been subjugated by Union bayonets. It had no immediate effect behind the Confederate lines, except to cause a good deal of excitement. But thereafter, as Union forces penetrated the South, the newly freed people deserted the farms and plantations and flocked to the colors. tions without official ties to specific states (others being the various U.S. sharpshooter regiments and the invalid Veteran Reserve Corps). By the end of the war 100,000 Negroes were enrolled as U.S. Volunteers. Many other Negroes served in state units, elsewhere in the armed forces, and as laborers for the Union Army. After Antietam both armies returned to face each other in Virginia, Lee situated near Culpeper and McClellan at Warrenton. But McClellan's slowness, his failure to accomplish more at Antietam, and perhaps his rather arrogant habit of offering gratuitous political advice to his superiors, coupled with the intense anti-McClellan views of the joint Congressional Committee on the Conduct of the War, convinced Lincoln that he could retain him in command no longer. On November 7 Lincoln replaced him with Burnside, who had won distinction in operations that gained control of ports on the North Carolina coast and who had led the IX Corps at Antietam. Burnside accepted the post with reluctance. Burnside decided to march rapidly to Fredericksburg and then advance along the railroad line to Richmond before Lee could intercept him. (Map 27) Such a move by the army�now 120,000 strong�would cut Lee off from his main base. Burnside's advance elements reached the north bank of the Rappahannock on November 17, well ahead of Lee. But a series of minor failures delayed the completion of ponton bridges, and Lee moved his army to high ground on the south side of the river before the Federal forces could cross. Lee's situation resembled McClellan's position at Malvern Hill which had proved the folly of frontal assaults against combined artillery and infantry strongpoints. But Burnside thought the sheer weight of numbers could smash through the Confederates. 147 heavy siege and field guns on the heights on the Union side of the river much could be achieved by a better-balanced attack along the whole line. Burnside's engineers had begun laying the bridges as early as December 11. But harassment from Confederate sharpshooters complicated the operation, and it was not until the next day that all the assault units were over the river. After an artillery duel on the morning of the 13th, fog lifted to reveal dense Union columns moving forward to the attack. Part of the Left Grand Division, finding a weakness in Jackson's line, drove in to seize the ridge, but as Burnside had weakened this part of the assault the Federals were not able to hold against Confederate counterattacks. On the right, the troops had to cross a mile of open ground to reach Marye's Heights, traverse a drainage canal, and face a fusillade of fire from the infamous sunken road and stone wall behind which Longstreet had placed four ranks of riflemen. In a series of assaults the Union soldiers pushed to the stone wall but no farther. As a demonstration of valor the effort was exemplary; as a demonstration of tactical skill it was tragic. Lee, observing the shattered attackers, commented: "It is well that war is so terrible�we should grow too fond of it." The Army of the Potomac lost 12,000 men at Fredericksburg while the Army of Northern Virginia suffered only 5,300 casualties. Burnside planned to renew the attack on the following day and Jackson, whose enthusiasm in battle sometimes approached the point of frenzy, suggested that the Confederates strip off their clothes for better identification and strike the Army of the Potomac in a night attack. But Lee knew of Burnside's plans from a captured order and vetoed the scheme. When the Federal corps commanders talked Burnside out of renewing the attack, both armies settled into winter quarters facing each other across the Rappahannock. Fredericksburg, a disastrous defeat, was otherwise noteworthy for the U.S. Army in that the telegraph first saw extensive battlefield use, linking headquarters with forward batteries during the action� a forerunner of twentieth century battlefield communications. If the major fighting of the Civil War occurred in the "older" populated sections of the United States, the youthful area of the American frontier across the Mississippi saw its share of action also. Missouri and Kansas, and indeed the distant New Mexico Territory (all areas involved in the root causes for the conflict), were touched by the Civil War. affording an outlet to the Pacific, makes its acquisition a matter of some importance to our Govt." Also it was assumed that Indians and the Mormons in Utah would readily accept allegiance to almost any government other than that in Washington. It was with these motives in mind that early in 1862 Confederate forces moved up the Rio Grande valley and proceeded to establish that part of New Mexico Territory north of the 34th parallel as the Confederate territory of Arizona. Under Brig. Gen. Henry H. Sibley, inventor of a famous tent bearing his name, the Confederates successfully swept all the way to Santa Fe, capital of New Mexico, bypassing several Union garrisons on the way. But Sibley was dangerously overextended, and Federal troops, reinforced by Colorado volunteers, surprised the advancing Confederates in Apache Canyon on March 26 and 28, as they sought to capture the largest Union garrison in the territory at Fort Union. unable to continue the contest and withdrew. For three more years guerrilla warfare would ravage Missouri but the Union grip on the state was secure. The year 1862, which began with impressive Union victories in the west, ended in bitter frustration in the east. Ten full-scale and costly battles had been fought, but no decisive victory had yet been scored by the forces of the Union. The Federals had broken the great Confederate counteroffensives in the fall only to see their hopes fade with the advent of winter. Apparently the Union war machine had lost its earlier momentum.